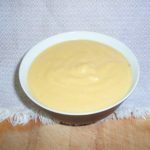 A year ago I wrote up a recipe for a vegan Creme of Squash soup, using silk tofu. 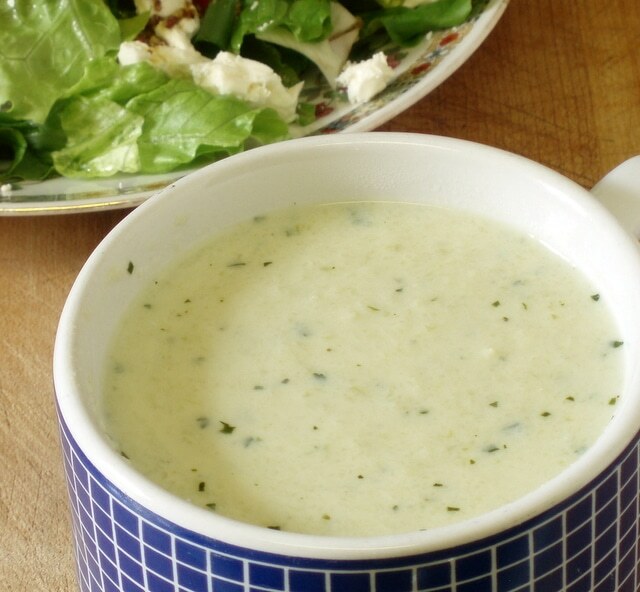 This broccoli soup is a variation of that theme. 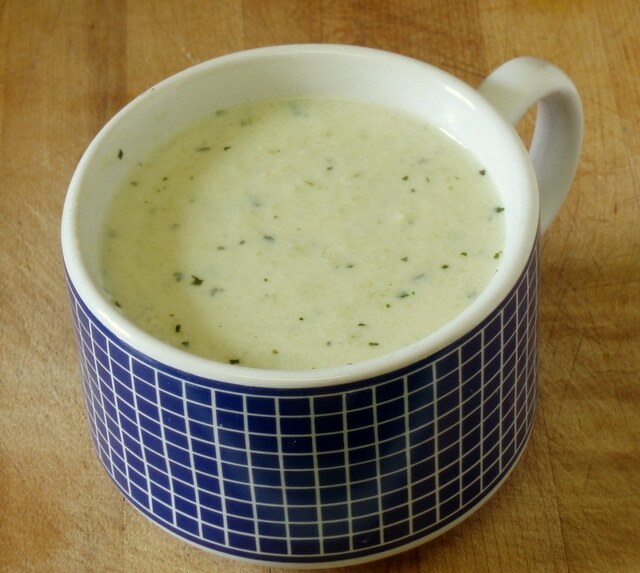 Again, this kind of soup doesn’t really make a meal on its own, as some of my soups do. It’s a great first course, though – we’re eating soup and salad together for lunch a lot now, since, as it gets cooler, salad alone feels as if it is missing something. I like a light soup to start a dinner, too – a serving of this feels festive, but gives us a serving of vegetables and a little protein to round out a meal. It’s very easy, too, to make (or at least start) ahead, and then just heat when you want it. We had a bunch of broccoli in our CSA last week, and I saved the stems. Then we got a new bunch this week – so I just cut the florets off, and reserved them for later. All together, I had about a pound of stems! (I more often have half that amount, and just make a half batch – just one bowl each for the two of us.) I trimmed off the cut ends, which dry out, and any woody bits. If it resists my knife, it goes… I don’t want hard fibrous pieces in my soup. This usually means peeling just a little close to the ends, and cutting the bottom end. (The older your broccoli is, the more will have dried… this is, unfortunately, one way to see how long it takes to get vegetables to your store.) I also trimmed the leaves, chopped them coarsely, and reserved them. 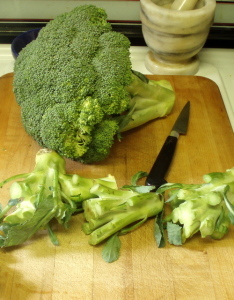 I cut the broccoli in fairly small pieces so they will cook quickly. While cutting them, I sauteed a chopped small onion and a minced clove of garlic in my soup pot – you can also, of course, use precooked onion from your freezer. I added the pieces, and a quart of water, with a pinch of salt. (You could use stock if you wanted – a meat stock, obviously, would make it no longer vegan.) I brought it all to a boil, and simmered for five minutes. (Well – that was the goal – I was interrupted, and it cooked a little longer than I wanted. You may want more or less time, depending on how you like your broccoli – we like it barely tender, and would have preferred this a minute or two sooner.) I then added the chopped broccoli leaves, so they would just barely cook in the residual heat. I added the package of silk tofu, and blended it. An immersion blender leaves the soup with a little more texture than blending in a carafe, which I like for this soup. I gently heated it back up to serving temperature, and served it, passing the peppermill, as freshly ground black pepper completed the flavor. A simple, vegan soup, using the stems of broccoli to make a delicious first course. 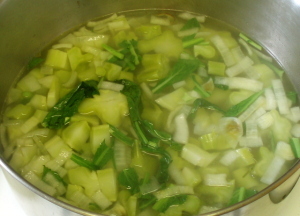 Saute onion and garlic in soup pot until soft. Add broccoli, a pinch of salt, and a quart of water, Bring to a boil, then simmer on low for 5 minutes (or to your preference.) Let cool slightly, if desired. 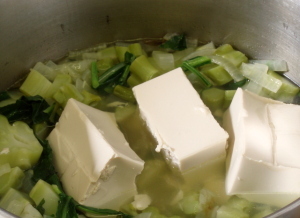 Add silk tofu to the pot. 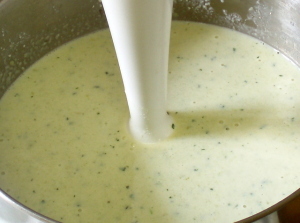 Use an immersion blender to puree soup until mostly smooth. Perfect timing! I thonk I will try this in the next few days using chopped broccoli. I have a TON of broccoli left from groom's picnic. I will pick up a silk tofu and m as ke this! It should be lovely with a leftover pork bbq sandwich! Hmm. 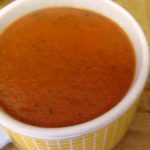 I've made this soup a number of times, and others with the same method many times, and have not had that happen - I'm sorry it did for you! And I'm glad you found a way to fix it, and thank you for sharing it with others! Trouble shooting mode - was it regular tofu, rather than silk? It can be used, but won't be as smooth. Did it come to a boil after adding the tofu? And did you check the date on the tofu? Even the aseptic packs are (eventually) perishable... I wouldn't expect any of them to actually make it separate, but they might... And your additions sound delicious. 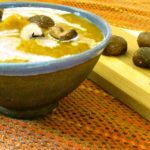 I did specifically want a vegan recipe here - but that's a perfect example of the way you can make a vegan (or vegetarian) base recipe, and add ingredients for the omnivores. I'm glad you stayed with it when you had an issue, and enjoyed it!